A drug that helps patients suffering lung cancer has been added to the Pharmaceutical Benefits Scheme. Australians with lung cancer could save as much as $90,000 a year after the federal government announced the listing of a cancer-fighting pill on the Pharmaceutical Benefits Scheme. The subsiding of Tagrisso from February 1 will bring down the cost of an individual script from $8000 - or $88,000 for an entire year of treatment - to a maximum of $40.30 per script. "These are the announcements I like making the most," Prime Minister Scott Morrison told reporters on Sunday. "Whether it is in drugs or providing clinical care, we are in this fight. We are going to fight cancer together and that's what our government is doing." 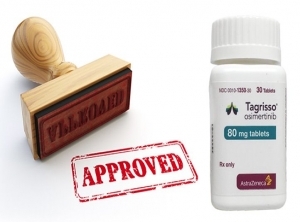 A once-daily pill, Tagrisso has been shown to slow the growth of metastatic non-small-cell lung cancer in patients. Father-of-three Bruno is one of 400 people will benefit from the subsidy, after being diagnosed with genetic-related lung cancer in 2015. "I had a recurring cough that wouldn't go away and it was only through a scan that I found out I actually had lung cancer," he said. "I had this mutation so the fortunate thing about that was I got to do one of these targeted therapies which has given me a quality of life which are thought I could never have." Cancer specialist Ben Solomon said the medication would help people suffering from a type of cancer that "does not discriminate". "It can affect people who have smoked and people who have never smoked in their lives before," he said. The subsidy is part of a $2.3 billion investment in cancer medicines by the federal government.